To draw on a graphic tablet fun and convenient. For this, you just need to properly configure the tools, inclination and rotation of the pen pressure. First the outline, followed by a detailed drawing. All operations are similar to traditional drawing with pencil on paper. After connecting the tablet to the computer, install the driver for your model device from the disk supplied or downloaded from the manufacturer's website. 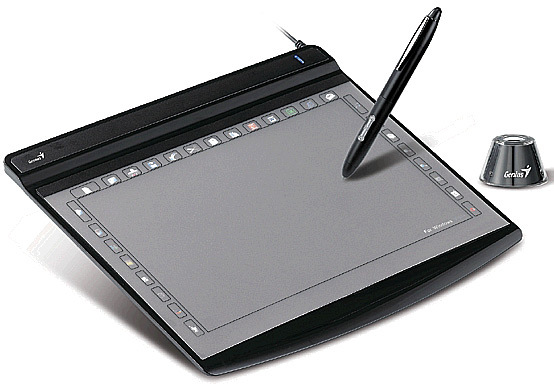 Adjust the the pen tablet control panel. The main attention is paid to the sensitivity adjustment to the level of pressure on the pen; installing forms, continuity, transparency and brush size. Adjust the tilt of the pen, its angle of rotation. Add eraser and other tools.Run the "anchor" of the tablet to the computer to work with Adobe Photoshop, which will speed up and simplify the work. A detailed description of the settings can be found in the instructions that came with the tablet. Adjust the reaction to the pen on the tablet for your own personal style of drawing. If necessary, create your personal brush. Make an initial sketch, then carefully draw all the details. Adjust the pressure and tilt of the pen, not afraid of experimentation. All hand movements and fine drawing are similar to those typical of traditional drawing with pencil on paper. Do not do during a sketch line the same throughout from beginning to end. Otherwise it will look unnatural to recall the wire. Plastic looks much more interesting line of varying thickness and brightness. For improved image detail, choose a higher resolution 500dpi the mouse mode, as the proportion of one screen of the monitor is equal to two or three screens of the tablet. If you wish to speed up the process, set the mode to 1:1 with the screen. Selection of colors appropriate to do on the computer, because it is much easier.